...OK. I've been to the ATM, and to the store. I've been so clever, figuring I'd just pack my own food--Weight Watcher bars and apples and get tomato juice on the planes. But I had forgotten to go buy apples, so I just did that too. Oh yes. Packing. If for some reason they won't let my carry on on, I'm up a creek. Ain't no way I'm checking baggage through and hoping it will meet me! In the middle of packing (you'd think I was going away for a month the way I've been carrying on about this weekend trip), I tried to get some work done at the office today, but I went in to do checkbook stuff which requires concentration and the nurse practitioner and her assistant were there talking and laughing and I couldn't hear myself think, much less concentrate on balancing the checkbook, so I left and decided I'd go back later tonight, but I didn't. I'll have to go in very early Monday and get it done before patients start arriving. Instead I decided to try doing transcription so the psychiatrist's stuff is all done before I leave, leaving only Dr. G's transcription, which I can probably whip out after I get home Sunday night. I took an hour off to wash walls. We're going to paint the walls in the stairwell and the deal was Walt would wash the upper part and I'd wash the lower part to prepare for actual painting. Only I haven't had time to get my part done, so I wanted to do at least part of it today. I scrubbed about 1/3 of it, working up a real sweat (more exercise) and was surprised that I really didn't notice much difference. The light in the stairs is really dim, so I was hoping that it was just the combination of my bad eyesight and the lighting. When Walt came home, he told me he'd already done that section of wall. Wasted effort! But we have the cleanest section of wall in town. 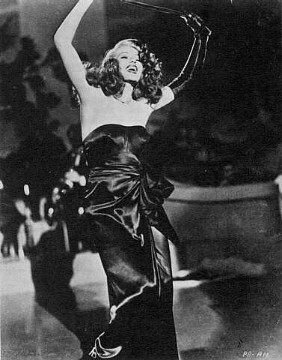 Tonight we saw Gilda, with Rita Hayworth and Glen Ford (and I stayed awake this time--must be that 7 hours of sleep I got last night). The plot can be summarized very easily: Ex-lovers Gilda and Johnny meet and throw insults at each other. Gilda tosses her hair a lot. Gilda slaps Johnny. Johnny slaps Gilda. They reconcile and live happily ever after. Mixed in among this are foreign bad guys, phallic symbols, smuggling, gambling, bribery and a bunch of other fun stuff. In the end, all the foreign guys are dead or in jail and the good Americans ride off into the sunset. Someone during the discussion asked what their life would be like after they returned to the states and set up houskeeping as a suburban couple. Can you see Rita Hayworth as a June Cleaver-type? Washing dishes? Ironing? I don't think so. So long, all...next entry from Steve's computer in Rochester.